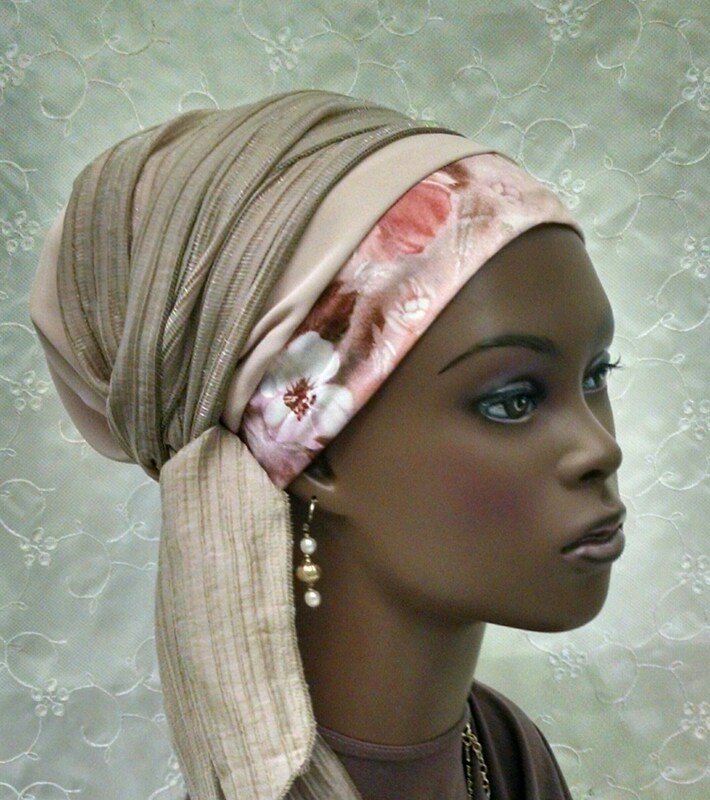 Fancy champagne and pink floral sinar tichel for special occasions! 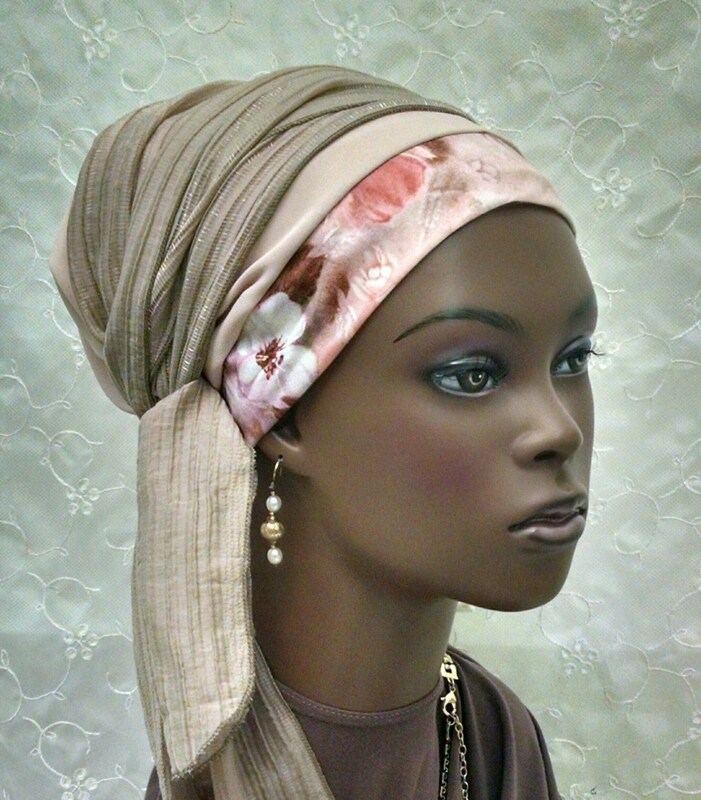 This tichel features a beautiful floral front piece and is wrapped in elegant textured ties with a slight sheen. 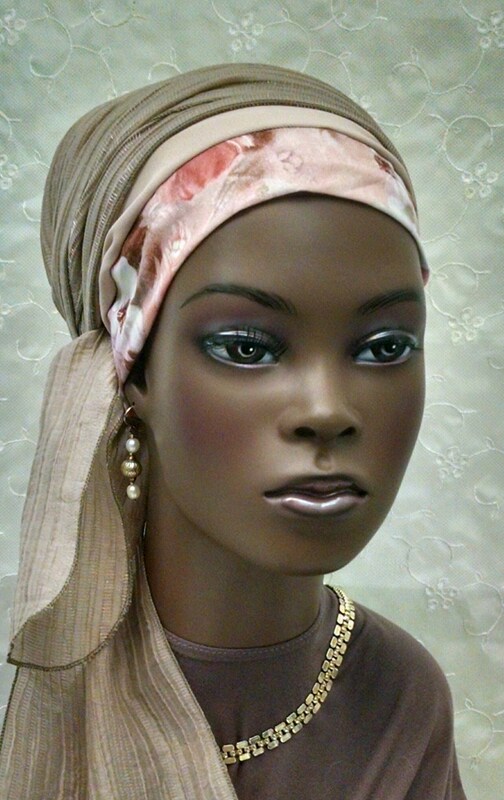 Perfect for Shabbat, weddings, evenings out and other special occasions! Ties are attractively tied off to the side! WHAT IS A SINAR TICHEL? Sinar is the Hebrew word for apron. 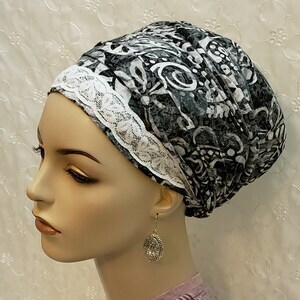 This style of tichel is traditionally called sinar apron as they are constructed like a small apron, with decorated ties that wrap around your head, creating the look of many scarves and headbands in one lightweight UNbulky tichel. 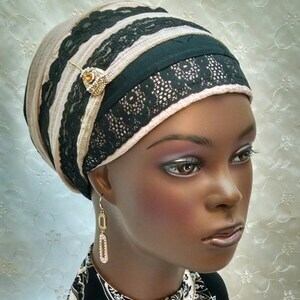 The special beauty about this type of tichel is that the tichel is designed with multiple fabrics, decorations and/or laces professionally sewn in place on one scarf. 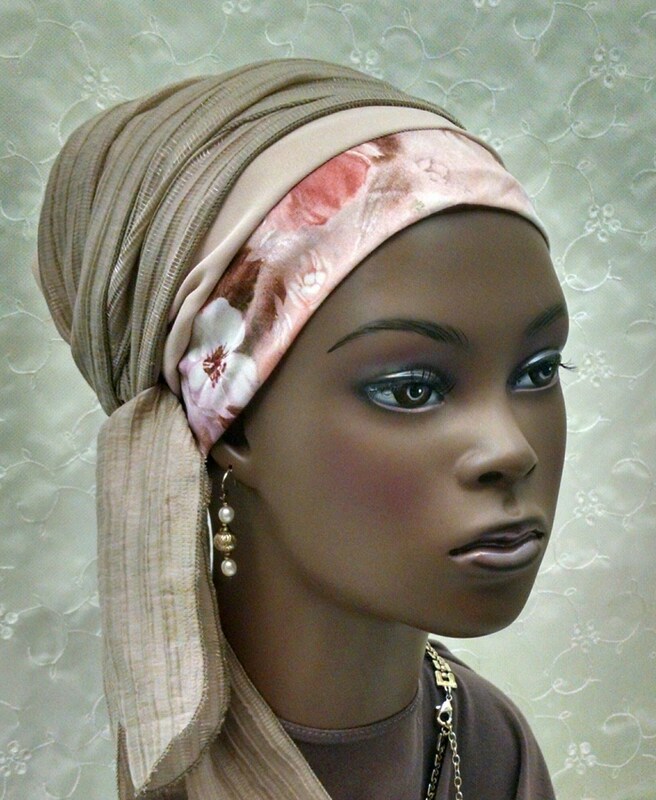 No more worries about matching up scarves and headbands and trying to position them straight. 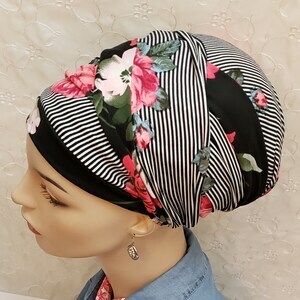 Sinar tichels, as are square or rectangular scarves, are often wrapped around a volumizer cap that you wear underneath the tichel to provide some shape, so the scarf doesn’t wrap around your head closely like a swim cap. Volumizers come in different shapes and sizes to suit your head shape and personal preferrences. I carry different shapes and sizes in my shop. They all come with built in nonslip headbands and Velcro attachments to create your own custom size. First, place the volumizer cap on your head, tucking all hair inside. 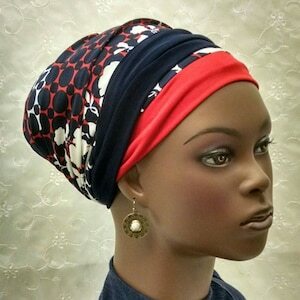 Then take the sinar tichel and lay it over your head with the design side on top and the ties coming from the scarf near your forehead, as opposed to from the nape of your neck. Tie the ties behind your head, at the nape of your neck. Gently pull at the ends of main body of the scarf so it lies nicely against your head, then tuck this material (not the ties!!!) behind your head under the volumizer cap. 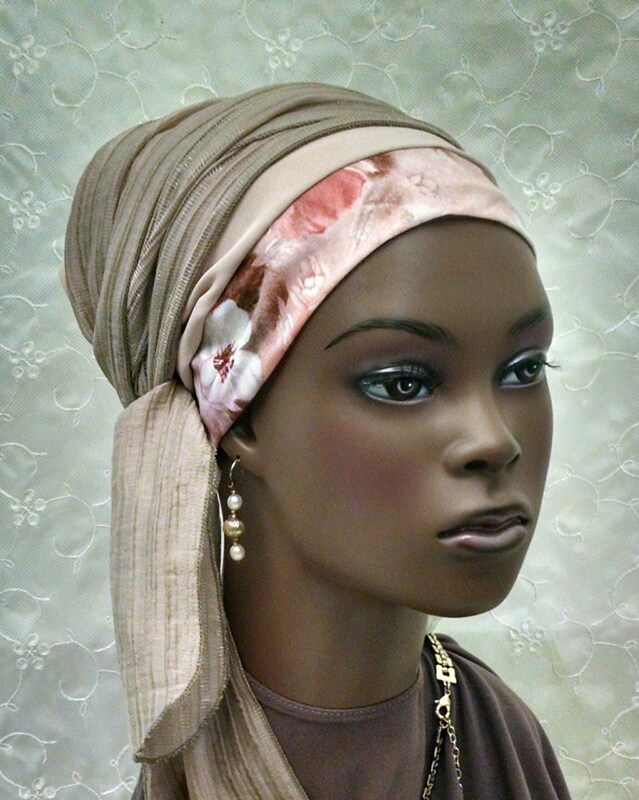 Last step, lay one tie over your head and then the next from the opposite side, arranging them to your taste or as seen in the picture for the particular style tichel you purchased, and tie behind your head. You can tuck the ends if you like.